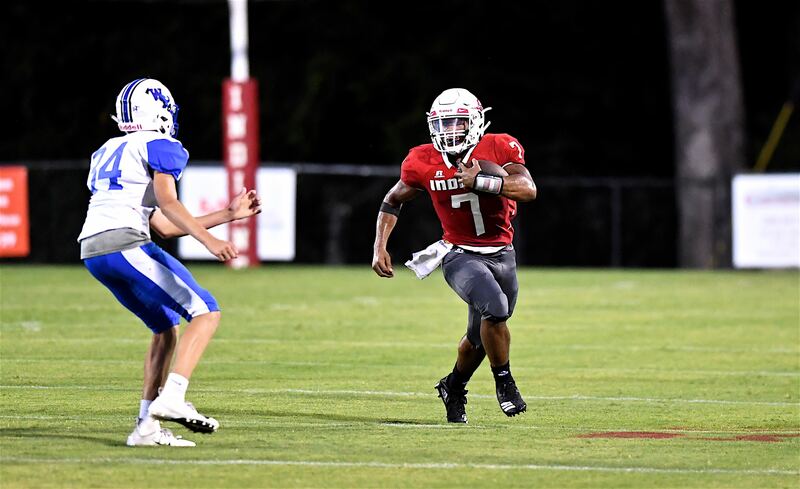 First team: POY Grayson Alward (QB), Offensive POY Domonique Thomas (RB), OL-DL Briley Hale, RB-LB Ryker Lambright, RB-LB Cam McCombs, TE-LB Larry Noah, OL-DL Josh Poole, RB-DL Aiden Simpson, OL-LB Cade Williamson. Honorable mention: RB-DB Noah Fuller, RB-DB Baylee Graham, OL-DL Greg King, TE-LB Josh Lipham, RB-DL Woodrow Vice. First team: Defensive POY Gunner Hollis (LB), RB-LB Jake Burson, OL-DE Brennan Gaines, LB Spencer Jordan, LB Jeremiah McCord, QB Josh Ralston, RB Christian Smith. Honorable mention: OL Brad Bailey, WR-DB Tye Bailey, WR-LB Caleb Hornsby, OL Jacob Winkles, OL Brock Young. First team: QB Jackson Cox, RB Huntr Grimes, OL Michael-Lake Haygood, DE Jackson Luttrell, WR P.J. Wells. Honorable mention: DL David Barnett, OL Derek Graham, OL Jonathon Hall, FB John Ross Morgan, WR Ryan Scott. First team: WR Parker Gilliland, QB Andrew Green, DL Adam Hernandez, OL Isaac Kelley. Honorable mention: DL Darrell Gilliland, OL Matt Lee, RB Daqarrius Phillips, LB Arturo Rico, DL Kyle Willis. First team: LB-F Dale Robertson, WR Briar Morris, LB Levi Brown. Honorable mention: QB Brock Edwards, OL Matthew Butler, RB Jakob Morris. First team: RB Kameron Hawkins, DL Lane Talbot. Honorable mention: OL Cole Wadsworth, SE Malik Redmond, LB Gage McArthur. First team: QB Jacob Jones. Honorable mention: Mason Barnett, Eli Pearce, Jeremiah Roberson, Hunter Tucker.